Huawei spent much of its press conference explaining all about its new, powerful smartphone line-up but kept its tablet plans on ice right until the end – where it revealed it was also launching the Huawei MediaPad 10 FHD. Although the company barely spoke about the tablet, specs have come to light which give us a little more idea what's under the MediaPad 10 FHD's bonnet. According to the Verge, who has gotten an hands on: Huawei MediaPad 10 FH Dreview up of the tablet, the device is seriously high end. The MediaPad 10 FHD boasts a 1080p display (1080 x 1200), an 8MP camera, the new Huawei-made K3 processor and is a mightily impressive 8.8mm thick. 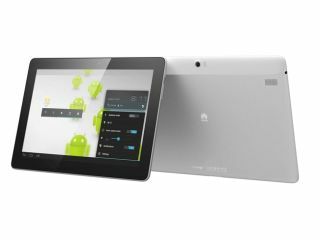 The reason the press conference didn't spend much time on the MediaPad 10 FHD is because the tablet is till in its early prototype stage. There's only one on show and that has been specially created for MWC 2012. Given that it is packing Android 4.0 and is set to be one of the speediest Ice Cream Sandwich tablets around, it's a bit of a shame we have to wait for it. But it does look as it the The MediaPad 10 FHD UK release date will be sometime in the second half of the year.